KIDS DON'T KNOW THEY'RE LEARNING! Logiblocs is now established in over 4,000 Primary Schools throughout the UK and has an increasing following in other parts of the world. As a powerful learning tool for teachers of Information Technology (IT) and Design & Technology (D&T) there's really no limit to the possibilities of using Logiblocs as a brilliant introduction to the worlds of logic, control, automation, robotics and design. Their portable and lightweight robust design eases classroom management and they provide an ideal basis for mini-topics which encourage social interaction and instil in children a life long interest in how things work. Logiblocs makes computer technology child's play offering children a brilliant way of finding out how microchip technology controls everyday systems such as lifts, trains, doors and traffic lights. Kids will begin to add in Logibloc automation into their models as a matter of course. Children gain a good insight into the process of design and improvements by trial and error using the actual plug-and-play blocs themselves. 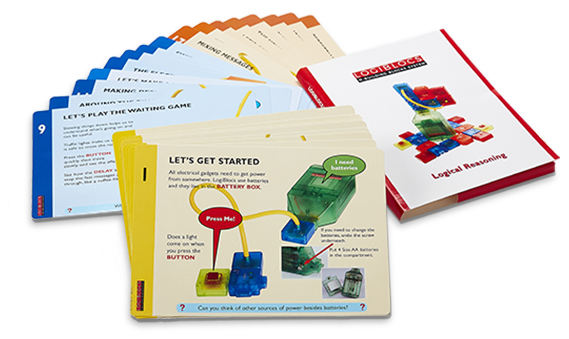 The Logiblocs usually have the power connected throughout a period of experimentation so giving children immediate feedback of their progress in making their circuits work as they plug and unplug at will. 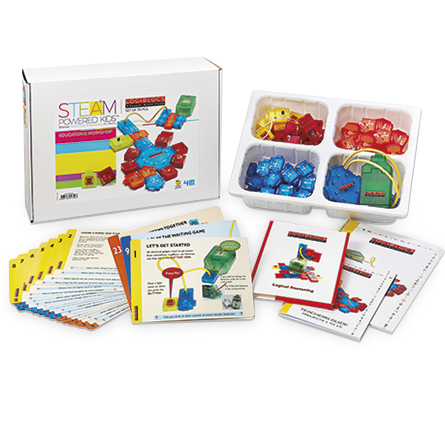 The pack provides great freedom for experimentation by children beyond the projects provided and has proved very popular with teachers. Includes 2 battery power supplies so that 2 groups can work at once. Batteries and modelling materials not supplied. This set of 24 colour laminated Work Cards allow groups to carry out simple projects with minimal supervision. Focusing on Control Systems and Digital Technology, each card poses questions about real life and design to stimulate class discussion.